In 1978, Joanne Molnar instituted a school radio station at Kenston High Schools, some 45 miles Southwest of Cleveland. It boasted a whopping 100 watts, and lived at 88.3 on the FM dial. The station was to serve as a vocational broadcast class, primarily serving the students and their families. These days, their audience ranges from Mentor to Medina (45 miles NE to SW) and from Lake Erie to Akron, (65 to 70 miles, North to South) depending on geothermics. Five years after its beginning, it had morphed into a rock-oriented station, but was still only 100 watts. Another six years later came a huge leap forward in the person of Chris Kofron, a native Clevelander, who had grown up listening to the music of the 'big bands' as well as cartoons, which at that time borrowed heavily from classical music as their musical accompaniment. He retains fond memories of having used his paper route money to buy music. It was this beginning that led to the vast musical history of American music – all in his head. With a big smile, he says, "I'm fully versed in Jazz, Blues, Country, Folk, Bluegrass, Rhythm and Blues and Rock and Roll. I also enjoy music from all around the world, as music is the purest form of human communication." A graduate of St. Ignatius High School, he then went to Cleveland State University, where he found his dream job at WCSB, the college radio station. He began with daytime hours, then summer time slots. This is the pattern he now employs in his position as Station Manager at the modern-day WKHR. However, he also teaches two 90-minute classes a day, plus labs to the high school students at the adjacent Kenston High School. "They learn to play good music and not put on airs, it is all applied hard work. Even though it's non-profit and free, classy presentations deserve a place In the world." Many, if not most, of the students end up on air, especially weekday afternoons. Some of them return after graduation and college years, just to keep in touch. At times, they end up with a regularly-scheduled program of their own. They choose the music they play, but of course, it has to fit the station's rules. No rock, reggae or rap, but on occasion, there may be a short trip to Western Swing or R&B. The teaching element has always been strong. These days it is marketing on a college level, with an emphasis on the four P's – product, price, place and promotion. In addition, there is radio production, such as on-air delivery, pronunciation ('Bix Beiderbecke,' for instance) although at times a simpler word will trip up someone. Programming depends on personal preference, plus show playlists. Students learn that this music is also a slice of history. Classes (at the school) also include producing public service spots, IT, and traffic regulations (log paperwork). The station, however, has three studios; one main and two production, mostly used for training. There is also a 5K scholarship awarded every year to honor the memory of one of the early founders of the station, Scott McVay, who 'saved the station'. It was his impetus that led to the station being incorporated as a non-profit organization, providing the necessary protection necessary to all young organizations. Speaking of 'free,' the station is indeed free – no commercials at all. One week out of the year, they have a fund-raising campaign, when all the announcers tend to pop in at off-times to add their voices to the plea. "We are your station, 24/7/365, commercial-free, just all music, virtually all-the time. If you value this type of music, please support it, if you can." It's very low-key, compared to some of the screeching done by other non-profit stations. Classy presentations, indeed. But the listeners back it all up – from around the world, thanks to the internet. Chris adds, "We don't try to influence our listeners, we want to make them feel good. Maybe bring back memories." It's a winning formula. 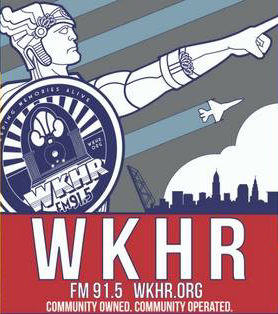 What does one hear 24/7 on WKHR, now boasting of 1000 watts at 91.5 FM, its current location on the radio dial, or WKHR.org, available to listeners around the world? The heart of the station is "The Great American Songbook," plus jazz, swing, big-band, and Broadway or Hollywood music. By 'big band,' they mean the named bands of the '30's through the early '70's: Benny Goodman, Glenn Miller, the Dorsey Brothers, Gene Krupa, Artie Shaw, and of course, the canaries: Lena Horne, Ella Fitzgerald, the Andrews Sisters, Judy Garland, Margaret Whiting, and others (too numerous to mention by name). And of course, there is the 'Ratpack': Frank Sinatra, Dean Martin, Sammy Davis, Jr.; Steve Lawrence and Edye Gorme, Rosemary Clooney, Bing Crosby, Fred Astaire, Nat 'King' Cole – and on and on. On rare occasions, you might hear a current entertainer, but one who excels at the golden oldies: especially singer/pianist Michael Feinstein, and the multi-talented Pizzarelli family: Bucky, John and Martin. There are also local Cleveland artists, who are available on recordings (probably not LP's, but the station is building a good collection of CD's). The only scheduled non-musical programming is on Sunday evenings from 8 to 10 PM – 'The Sunday Night Bijou' hosted by one of the former students who came back home to indulge his taste for 'old-time radio programs'. Usually, there are four half-hour broadcasts from the '30's to the '60's. Comic staples such as 'Our Miss Brooks', 'Duffy's Tavern' or 'The Jack Benny Show', alternate with suspense classic 'The Shadow Knows' and mystery classic 'The Thin Man' or westerns like 'The Lone Ranger' or 'Gunsmoke.' Even if these aren't musical productions, they're still a fond remembrance of that earlier era, when life was simpler and more quiet. One of the joys of listening to WKHR is the rather low key presentations. No screaming, ever, not even from the younger generation there. In addition to NO commercials, ever, all the folks who labor there (other than Chris) are volunteers. He says there are about 40 adults and 30 students who talk into those microphones. Perhaps 55 to 60% are male, with of course, 40-45% female. They range in age from 14 to 90. Many are local musicians or actors, but they all have a strong love for the music they choose to play for us. Good thing that, as there are not only no paychecks, but also no benefits, which are usually a huge enticement for employees. He thinks this makes the station unique in this country, if not the world. On any given day, you might hear a '40's boogie-woogie, followed by the 1939 Benny Goodman hit "Sing, Sing, Sing!" then a few songs from a Broadway hit such as Annie, Get Your Gun! Then, maybe a chunk from a WWII radio show featuring one of the big bands performing for the military. Each announcer has his or her own preferences and specialties. They take requests while on the air, and can usually dig out the piece and get it on that same day, or maybe the next time around. Some announcers develop a theme for each show, and the creativity involved in this endeavor is astonishing. Of course, considering the size of the music library available to everyone. In the next room, over from the main studio, Chris estimates there are 10,000 LP's. Yes, you read that right- ten thousand LP's. As such, it's usually not overly difficult to find the requested piece. Once a week, on a regular basis and at other times as a fill-in announcer, he may play music non-stop for 27 or so minutes, then do a back-announce, in his straightforward 'stream of consciousness' style, providing all the essential information for a listener to revel in the sound. Sadly however, the listener cannot see him dancing around the studio, then bopping out to the LP library, to pull something else, and get back into the studio before the current cut ends. Last fall, there was a 'maintenance issue' in the building that houses the station, and for the next three months, they were forced to shut down active participation by their lively staff of volunteers. However, there was no on-air downtime, thanks to the ever-present 'Overnight' system. There are several 'volumes' (for lack of a better term) of pre-recorded musical selections, with a pre-recorded short station-break every fifteen or so minutes. Because of the variety available, one does not hear the same recorded bits over and over non-stop, even though the station is on-air 24 hours a day. This is another brainchild of the erstwhile station manager. As Chris adds, "We're different – we're a handshake in a world of contracts."